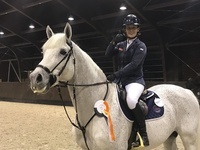 This weekend, Kathi competed at the CSI4* show X-Bionic Indoor Masters in Samorin, Slovakia. JK Horsetrucks Leasure Z recorded his best result to date when finishing 3rd in the CSI4* Grand Prix after jumping two beautiful clear rounds over the 1.60m track. Elien also did a great job, and finished 8th in Saturday's 1.50m world ranking class after a clear first round. Next weekend, Kathi competes at a national show before it is time for the CSI4* Jumping Indoor Maastricht.